Entering the University Plaza Waterfront Hotel on a Friday evening, it’s hard to imagine that this downtown project was once considered a flop. A steady stream of residents and hotel guests trickle in and out of the building while throngs of Thunder fans enjoy a pre-game meal in the hotel’s restaurant and bar. It is among this lively setting where Preet Kaur greets me, an hour and a half after our initial interview time. Kaur is very busy these days showing units and securing residents for Stockton’s only real downtown housing option, even though most people are unaware that any option exists at all. Conventional wisdom has been that downtown is too dangerous and too empty to support residential development. And while conventional residential projects have yet to take hold, the University Lofts is quietly showing that a market for housing in Downtown Stockton does exist. Of the residential units available today, 70% are occupied by University of the Pacific undergraduate and graduate students, and 30% are filled by professionals such as police officers and even Mayor Anthony Silva. This modest amount of professional residents is even more impressive considering that the building’s marketing efforts to this demographic are virtual nonexistent. The University Lofts’ initial success represents a complete 180 from the project’s previous incarnations, where the hotel went through foreclosure– twice. The University Plaza Waterfront Hotel and University Lofts started out as the Sheraton at Regent Pointe, and then the Lexington. Before the building carried the University Plaza Waterfront Hotel and University Lofts names, the hotel was known the Lexington Plaza, and the Sheraton at Regent Pointe before that. Completed in 2007 as part of the waterfront events center, the Sheraton was billed as the “largest private investment in downtown” in 20 years, with a price tag of $61.5 million. The original plan included 178 hotel rooms as well as 42 condos on the upper floors priced as high as $750,000. Back then, a red-hot real estate market ignited hope that high-end homes could be sold downtown. But before the first unit could be purchased, the bottom of the housing market fell out. The project was a boondoggle, headed for the auction block like so many other Stockton properties. That’s when Patrick K. Willis saw an opportunity. 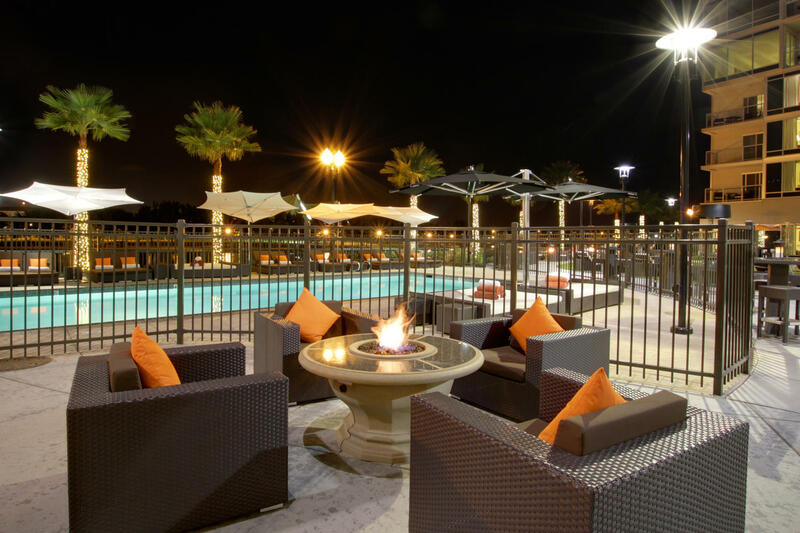 Willis acquired the property for $10 million– a paltry sum considering the hotel’s original price tag– and immediately turned the hotel around, investing in marketing, bringing in events, purchasing chic patio furniture and completing the construction of the hotel’s pool. And while the hotel became profitable, dozens of condo units remained idle on the hotel’s top floors. How could they be used? Former mayor Anne Johnston suggested using the space for student housing, according to Cooley, and brought in officials from UOP to see if they would consider such a proposal. UOP got on board, and Willis’ $2.5 million conversion from swanky condos to student dwellings began. While some students moved in during the 2012 winter semester, the University Lofts welcomed its first full year of UOP students last August. Kaur is already busy getting student leases signed for the start of the next academic year, saying that they are already 90-95% leased out for the fall. Is housing in Downtown Stockton feasible? The University Lofts are filling up with more than students. While the pricing structures are technically geared toward UOP undergrads and graduates, the layouts and furniture (all rooms come fully furnished, no exceptions) of most rooms are organized like regular apartments and can be leased by anyone, and several Stocktonians have taken advantage. In recent months, the University Lofts has seen a surge in interest from working professionals willing to pay a premium to live in downtown. The rents at the University Lofts appear to be more closely aligned with Bay Area apartments, with units leasing anywhere from $900 for a studio to up to $2,500 for a two bedroom (including utilities, internet and cable). 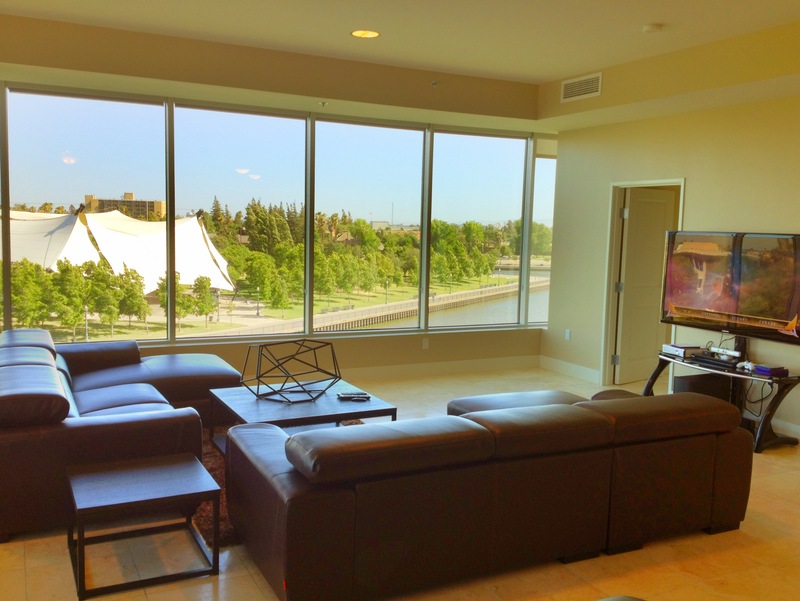 By comparison, the average Stockton rental price ranges from $600 to $900. But even with these high prices, the Lofts are experiencing no shortage of interest. “When we have studios and one bedrooms open up, they are gone within a week,” said Kaur. The initial success of the University Lofts is even encouraging other downtown developers to get into the residential business, according to Cooley. People in the community are taking notice. Kaur says that she gives dozens of tours each week to curious passersby. Cooley admits that the surrounding areas are not the nicest. Nevertheless, he notes that many residents enjoy the University Lofts precisely because it keeps them safe from crime. The building features limited points of entry, 24-hour security, and card access to residential floors. The biggest problems are the occasional automobile break ins. Even with the area’s bad reputation, Kaur says that their residents feel that being downtown is a big plus. Cooley also feels that the area will only become safer as more residents decide to make downtown their home. It has not been all smooth sailing. In the fall of last year, UOP proposed spending $20 million on new on-campus housing just north of the Calaveras River. The plans were sailing through the review process until concerns were raised with the city planning commission regarding the project’s environmental review. The complaints were brought on by the University Lofts, causing some to question the hotel’s motives. Even so, UOP was not happy, especially since the university helped get the University Lofts started, putting together student focus groups and advertising the Lofts on campus. But despite this “hiccup,” Cooley believes that they continue to enjoy an amicable relationship with the University. UOP Vice President for External Affairs and Athletics Ted Leland agrees. Eventually, the University Lofts may revert to more market-rate type apartments. The units were also designed to be easily converted back to condos in the event that the market heats back up. For now, the University Lofts is enjoying success, and they want downtown to be a part of it. This is a great story. It would be interesting to read a follow up and compare the numbers one year later ….